How may a person distinguish between truth and error? Can a person know which religion, if any, is right? Must a person rely on subjective inner inclinations and feelings? Or is religious truth ascertainable and knowable based on objective assessment? Some religions (e.g., Buddhism and Hinduism) base their credibility on some mystical or transcendental experience. Even some “Christian” groups claim that their credibility and authenticity may be established on the basis of the Holy Spirit Whom, they say, gives them their assurance. But when the Bible is examined, no such role is assigned to the Holy Spirit. Mystical religions have always existed, and have insisted that they are the recipients of leading and guidance from superior forces that are “better felt than told.” The God of the Bible, on the other hand, always offered evidence—proof—of the divine origin of the message before He expected people to believe (e.g., John 10:37-38; 20:30-31; Deuteronomy 18:21-22). The nature of truth is such that it does not contradict itself. After literally centuries of scrutiny by hostile skeptics and unbelieving critics, the Bible has been found to be completely consistent with the nature of truth, logic, and the laws of thought (Lyons, 2005). On the other hand, uninspired documents cannot stand up to such scrutiny. The Book of Mormon is one such document. It lacks the marks of inspiration that characterize the Bible. In an official publication of the LDS (Latter-day Saints), 31 conditions are identified as necessary in order to produce an inspired book. Condition #9 says, “You must not make any absurd, impossible, or contradictory statements” (“The Challenge...,” 1990, p. 1). This affirmation is a self-evident truth. Yet, The Book of Mormon is guilty of violating these very criteria. In the first place, much of the King James Version of the Bible has been reproduced verbatim in The Book of Mormon—estimated to be from 17,000 to 27,000 words (Tanner, 1972, p. 81; cf. Bales, 1958, p. 157). For example, Mosiah 14 is a reproduction of Isaiah 53. Third Nephi 13:1-23 is simply Matthew 6:1-23. Moroni 7:45 is copied from 1 Corinthians 13:4-7. Moroni 7:48 is 1 John 3:2. Moroni 10:8-17 is taken from 1 Corinthians 12:4-11. Alma 5:52 is Matthew 3:10. Second Nephi 14:1-3 is Isaiah 4:1-3. 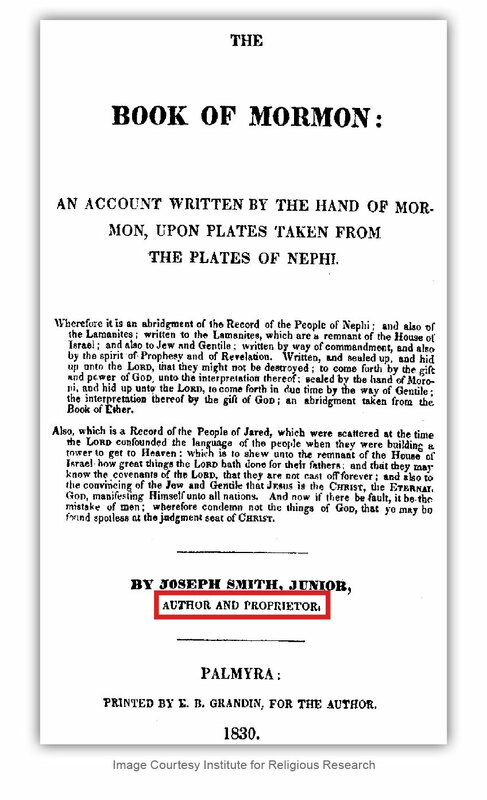 The author of The Book of Mormon obviously had before him a copy of the King James Bible, and simply copied many sections directly from it (though it is claimed that The Book of Mormon was actually written from 600 to 421 B.C. [see “A Brief Explanation...,” 1981]). But this is only half of the problem on this point. The KJV is an uninspired translation of available Hebrew and Greek manuscripts into the English language of the late 16th and early 17th century, completed in 1611. But God gave the Old Testament to the Israelites in their native language (Hebrew), and He gave the New Testament in the first century in the common language of that day (Koine Greek). Question: why in the world would God give His Word to Joseph Smith in 19th century America (1830), not in American English, but in the British language of 17th century England? The obvious answer to the question is that God would not do so. This absurdity is inconsistent with the nature of God. The reproduction of so much of the KJV in The Book of Mormon raises four additional concerns. First, Mormons frequently attempt to establish the superiority of The Book of Mormon over the Bible by insisting that the Bible has been corrupted through the centuries in the process of translation (a contention similar to Islam’s defense of the Quran—see Miller, 2005). But if the Bible has been so adversely affected, why does The Book of Mormon quote so much of the King James Version? To be consistent, those who hold this viewpoint must admit that at least those portions of the Bible are to be considered accurate. Second, all textual critics (those who study the original manuscript evidence that attests to the text of the New Testament) know that textual variants exist in the extant manuscript evidence. The vast majority of these discordant readings are resolved when all of the textual evidence is considered (e.g., Metzger, 1968, p. 185). If The Book of Mormon were inspired, not only would it refrain from incorporating the King James Version within its pages, it also would not include in those sections the manuscript errors that have crept into the text. Here was the perfect opportunity in 1830 for God to clarify the variants that had accumulated during the previous 200 years (as well as the 1,500 years prior to the KJV). Instead, The Book of Mormon perpetuated the mistakes. For example, several textual variants occur in Matthew 6—a chapter that was reproduced in 3 Nephi 13. In Matthew 6:4, the Textus Receptus (the Greek text upon which the KJV was based) contained the words “himself” and “openly.” These insertions were perpetuated by the author of The Book of Mormon in 3 Nephi 13:4, as was the word “openly” in verses 8 and 16 of Matthew 6 (and 3 Nephi 13:6,18). Likewise, the Trinitarian ascription in 3 Nephi 13:13 and Matthew 6:13 in the KJV (“For thine is the kingdom, and the power, and the glory, for ever. Amen”) is not supported by the earliest and most reliable manuscript witnesses to the text of the New Testament. Subsequent translations, including the ASV, omit the sentence altogether, or, in the case of the NASB, place it in brackets. The manuscript evidence simply does not support these additions as being in the original, inspired autograph authored by Matthew. Many additional instances of this same type of faux pas can be cited. The one who was responsible for producing The Book of Mormon in these cases unquestionably (1) relied on the KJV and (2) demonstrated his ignorance of textual criticism. 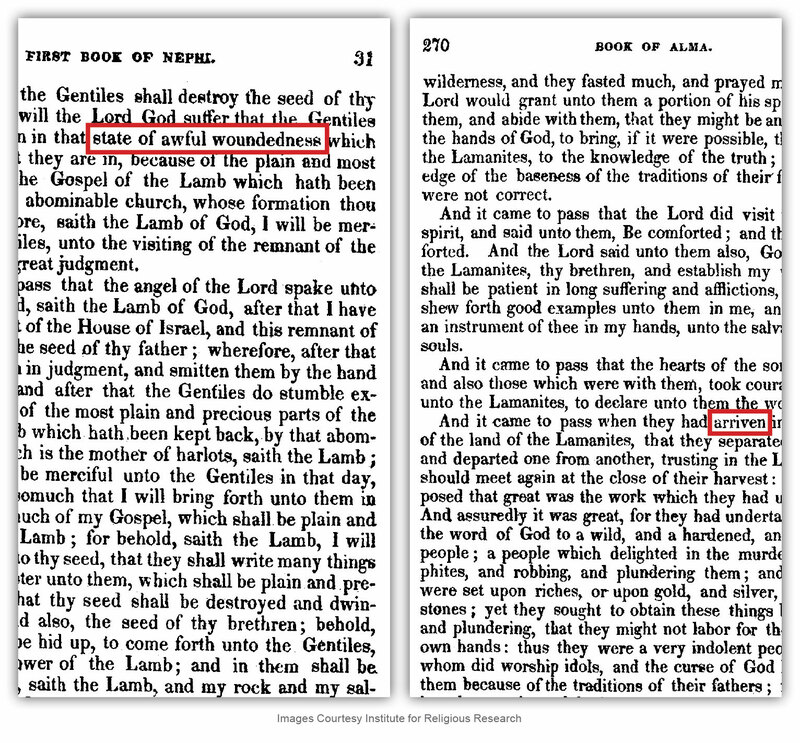 Third, in addition to errors that are due to textual variants, the KJV also made grammatical and stylistic errors that were naively copied by The Book of Mormon. For example, in Hebrew, singular masculine nouns are changed to plural by appending “im” (pronounced “eem”)—the equivalent of “s” or “es” in English. The Hebrew words “cherub” and “seraph” are singular nouns. The plural forms of these words are “cherubim” and “seraphim.” The KJV translators mistakenly added an “s” (“cherubims” and “seraphims”) to these terms to denote a plural form (e.g., Genesis 3:24; Exodus 25:18,19,20,22; Isaiah 6:2,6; Hebrews 9:5). Alluding to cherubim, Adam Clarke explained: “[T]o add an s to this when we introduce such words into English, is very improper; therefore the word should be written cherubim, not cherubims” (n.d., 1:56, italics in orig. ; cf. Lewis, 1991, p. 59). 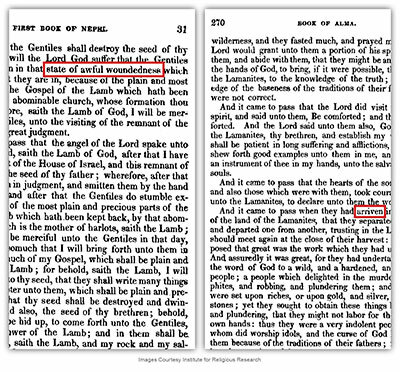 Yet the original 1830 Book of Mormon reproduced the same mistake as the KJV in this regard (Alma 12:21; 42:2,3; 2 Nephi 16:2,6), though corrections were made in later editions. The unbiased observer is forced to conclude: God knows Hebrew and how to transfer words from one language to another; the author of The Book of Mormon obviously did not. Another sample of stylistic error is the use of the expression “it came to pass.” This expression is a Semitism, or Hebraism, i.e., an idiomatic oddity or peculiarity of the Hebrew language that lacks a corresponding equivalent in English. 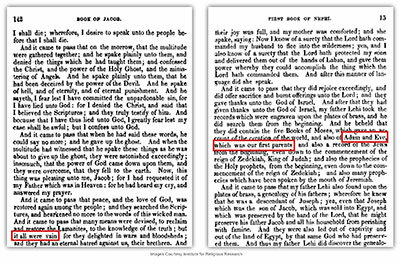 Newer translations either drop it completely or render it with an approximate English equivalent like “it came about” or “it happened.” The KJV simply transferred the Semitism directly into English and, under its influence, has caused the expression to be naturalized into English religious usage. Nevertheless, it is not an idiom that is native to English. Yet The Book of Mormon is literally inundated with the expression—as if the author was deliberately attempting to make his writing sound biblically or divinely authentic. In reality, he was unwittingly making it sound Semitic in 17th-century English! But God would not have communicated with Americans in 1830 through the convoluted pathway of Hebrew, to 17th-century British English, to 19th-century American English. Likewise, the peoples of the specific historical periods that The Book of Mormon claims to be depicting (e.g., the Nephites) would have had no earthly reason to have spoken in Hebrew themselves, nor to have their history reported in Hebrew phraseology and Semitic idiom. Apparently, later Mormon authorities, unable to completely eradicate this stylistic feature due to its extensive occurrence, were nevertheless so uncomfortable with the overuse of the phrase that they have deleted some of its occurrences when so many were used in close proximity with each other. 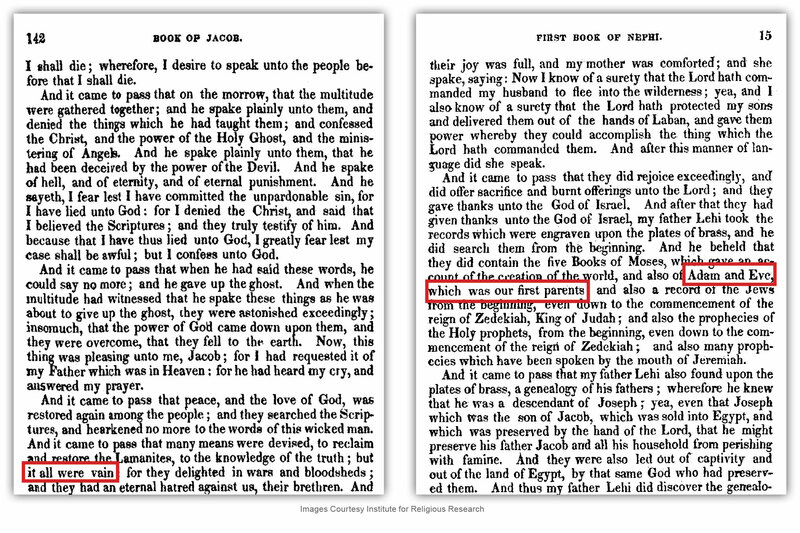 For example, in Alma 14:7, the original Book of Mormon had three occurrences of “it came to pass”—in the same verse! Current editions have only one—which raises the additional question of The Book of Mormon’s own faulty transmission. 19 And it shall come to pass, that whosoever will not hearken unto my words which he shall speak in my name, I will require it of him. 22 For Moses truly said unto the fathers, A prophet shall the Lord your God raise up unto you of your brethren, like unto me; him shall ye hear in all things whatsoever he shall say unto you. 26 Unto you first God, having raised up his Son Jesus, sent him to bless you, in turning away every one of you from his iniquities. 23 Behold, I am he of whom Moses spake, saying: A prophet shall the Lord your God raise up unto you of your brethren, like unto me; him shall ye hear in all things whatsoever he shall say unto you. And it shall come to pass that every soul who will not hear that prophet shall be cut off from among the people. But the word of God burdens me because of your grosser crimes. For behold, thus saith the Lord: This people begin to wax in iniquity; they understand not the scriptures, for they seek to excuse themselves in committing whoredoms, because of the things which were written concerning David, and Solomon his son. Behold, David and Solomon truly had many wives and concubines, which thing was abominable before me, saith the Lord.... Wherefore, I the Lord God will not suffer that this people shall do like unto them of old. Wherefore, my brethren, hear me, and hearken to the word of the Lord: For there shall not any man among you have save it be one wife; and concubines he shall have none; For I, the Lord God, delight in the chastity of women. And whoredoms are an abomination before me; thus saith the Lord of Hosts (Jacob 2:23-24,26-28, emp. added; cf. 1:15; Ether 10:5; Doctrine and Covenants 49:16). Verily, thus saith the Lord unto you my servant Joseph, that inasmuch as you have inquired of my hand to know and understand wherein I, the Lord, justified my servants Abraham, Isaac, and Jacob, as also Moses, David and Solomon, my servants, as touching the principle and doctrine of their having many wives and concubines—Behold, and lo, I am the Lord thy God, and will answer thee as touching this matter. Therefore, prepare thy heart to receive and obey the instructions which I am about to give unto you; for all those who have this law revealed unto them must obey the same. For behold, I reveal unto you a new and an everlasting covenant; and if ye abide not that covenant, then are ye damned; for no one can reject this covenant and be permitted to enter into my glory. ...David also received many wives and concubines, and also Solomon and Moses my servants, as also many others of my servants, from the beginning of creation until this time; and in nothing did they sin save in those things which they received not of me. David’s wives and concubines were given unto him of me, by the hand of Nathan, my servant, and others of the prophets who had the keys of this power; and in none of these things did he sin against me save in the case of Uriah and his wife (132:1-4,38-39, emp. added). To avoid self-contradiction, the author of The Book of Mormon and Doctrine and Covenants could have worded these verses differently. For example, he could have stated that God enjoined plural marriages at one point in history, but chose not to enjoin the practice at another point in history. Or, he could have said that plural marriages were to be practiced by some people early in history but not by others later in history. In either case, no contradiction would exist. A Bible example is seen in the fact that God enjoined animal sacrifice on the Jews in the Old Testament, but forbade its use for all people in the New Testament. But this is not what Mormon scripture does! It specifically identifies the polygamy of David and Solomon, and then makes the mistake of both approving and condemning it. This circumstance constitutes a flat contradiction. David and Solomon having multiple wives was both right and not right at the same time and in the same way. Two statements are contradictory when they cannot both be true (cf. McGarvey, 1974, 3:31). [NOTE: Yet another indication of Joseph Smith’s uninspired status was his allusion in the above quotation (Jacob 2:27) to a man being permitted only one wife, but “concubines he shall have none.” This reference betrays an ignorance of the use of an ancient term. A “concubine” in antiquity was a wife—not a mistress (unmarried sexual partner)—despite popular misconception (cf. Hamilton, 1980, 2:724)]. In excerpts from three addresses that he delivered regarding this manifesto, Woodruff explained that if they continued to practice plural marriage, temples would be confiscated by the civil authorities, and the First Presidency and Twelve, and family heads, would be imprisoned. If, on the other hand, they ceased the practice, in order to abide by the law of the land, they would be able to continue the duties and ordinances of the church (including baptism for the dead). Question: Why would God refer to plural marriage as a perpetual practice that would bring damnation upon those who fail to practice it, and then call for Latter-day Saints to refrain from such marriages? God is timeless, and would have known ahead of time that the U.S. government would reach a point at which it would call the Mormon practice of plural marriage to account. Therefore, He would not have enjoined the requirement as “everlasting” if He later intended to nullify the practice. Nor would God have withdrawn one of His “everlasting commandments” simply because the law of the land by a pagan government made the commandment illegal and implemented persecution. When in all of human history has God ever bowed to civil government in its opposition to His will—even when it brought severe persecution and death to His followers? Another legitimate affirmation listed in “The Challenge” is condition #10: “When you finish in 60 days, you must make no changes in the text. The first edition must stand forever” (p. 1, emp. added). “Houston, we have a problem.” Informed students of the Bible are well aware that no original autographs of the Bible are extant. We are completely dependent upon copies of copies of copies (e.g., Comfort, 1990, p. 4). Not so with The Book of Mormon. The Lord caused each word spelled as it is in the Book to appear on the stones in short sentences or words, and when Joseph had uttered the sentence or word before him and the scribe had written it properly, that sentence would disappear and another appear. And if there was a word wrongly written or even a letter incorrect the writing on the stones would remain there. 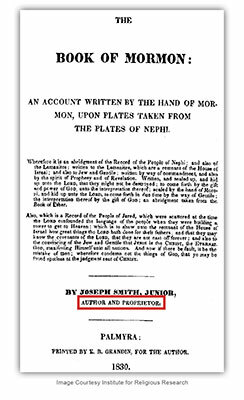 Then Joseph would require the scribe to spell the reading of the last spoken and thus find the mistake and when corrected the sentence or word would disappear as usual (n.d., p. 168, emp. added). I will now give you a description of the manner in which the Book of Mormon was translated. Joseph Smith would put the seer stone into a hat, and put his face in the hat, drawing it closely around his face to exclude the light; and in the darkness the spiritual light would shine. A piece of something resembling parchment would appear, and on that appeared the writing. One character at a time would appear, and under it was the interpretation in English. Brother Joseph would read off the English to Oliver Cowdery, who was his principal scribe, and when it was written down and repeated to Brother Joseph to see if it was correct, then it would disappear, and another character with the interpretation would appear. Thus the Book of Mormon was translated by the gift and power of God, and not by any power of man (Whitmer, 1887, Ch. 1, emp. added). Consider a few of the estimated 4,000+ grammatical mistakes that have been corrected in subsequent editions. The original 1830 Book of Mormon in Jacob 7:24 read, “but it all were vain.” Alma 48:25 read, “for the promise of the Lord were....” Alma 53:5 read, “it were easy to guard them.” 1 Nephi 5:11 read, “Adam and Eve, which was our first parents.” All of these grammatical (not printer) errors have been corrected in more recent editions. Consider also a few of the many changes that have been made that correct content mistakes. In Mosiah 21:28, “Benjamin” has been changed to “Mosiah” (since King Benjamin was already dead at this point in the narrative—Mosiah 6:4-5). In Alma 37:21, “directors” has been changed to “interpreters.” In 1 Nephi 13:32, “state of awful woundedness” has been changed to “awful state of blindness.” In Mosiah 27:29, “wrecked” has been changed to “racked.” In Alma 13:20 and 41:1, “arrest” has been changed to “wrest.” In Alma 17:13, “arriven” has been changed to “arrived.” Even the original 1830 title page, which listed Joseph Smith as “Author and Proprietor,” has been altered; now he is simply “translator.” In 1 Nephi 20:1, the phrase “or out of the waters of baptism” has been inserted. It was not in the original 1830 edition. Please observe: Printers occasionally transpose letters, or garble a word, or insert the same line twice, or omit a word or two, perhaps a line here and there. But the above changes are not the kinds of errors that printers make. Bales, James (1958), The Book of Mormon? (Rosemead, CA: Old Paths Book Club). 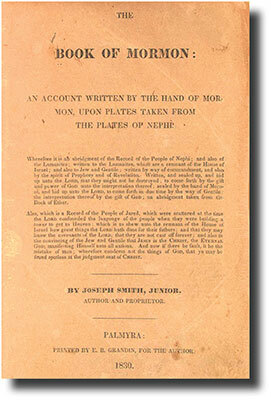 The Book of Mormon (1830), (Salt Lake City, UT: Church of Jesus Christ of Latter-day Saints), [On-line], URL: http://www.irr.org/mit/bom/1830bom-default.html. The Book of Mormon (1981 reprint), (Salt Lake City, UT: Church of Jesus Christ of Latter-day Saints). “A Brief Explanation About the Book of Mormon” (1981), The Book of Mormon (Salt Lake City, UT: The Church of Jesus Christ of Latter-day Saints). “The Challenge the Book of Mormon Makes to the World” (1990), (Euless, TX: Texas Fort Worth Mission). Comfort, Philip (1990), Early Manuscripts and Modern Translations of the New Testament (Wheaton, IL: Tyndale House). Hamilton, Victor P. (1980), “pilegesh,” in Theological Wordbook of the Old Testament, ed. R. Laird Harris, Gleason Archer Jr., and Bruce Waltke (Chicago, IL: Moody). Answers to Alleged Bible Discrepancies (Montgomery, AL: Apologetics Press). Lyons, Eric and Bert Thompson (2002), “In the ‘Image and Likeness of God,’” Reason & Revelation [Part I & Part II], 22:17-23,25-31, March/April. Tanner, Jerald and Sandra (1972), Mormonism: Shadow or Reality? (Salt Lake City, UT: Modern Microfilm). Whitmer, David (1887), An Address to All Believers in Christ, [On-line], URL: http://www.irr.org/mit/address-ch1.html.